“Three-hundred dollars,” announces the player on my right as he slides out his river bet. For purposes of this blog, I’ll call him “Omar.” We are at the MGM National Harbor casino outside Washington, DC early Saturday afternoon. I’ve been at this $2/5 no limit Texas Hold’em table about an hour, and noted that Omar is a loose, aggressive player willing to bluff on the river. On one earlier hand, he bet/folded on the river. On another, his bluff was called and he mucked his hand without showing. He’s been one of the most active players at the table during my short time there. The board was A♥K♥4♦ – 6♦ – Q♥ with a little over $400 already in the pot. I have AQ off-suit, improving to a strong 2-pair with the river card. 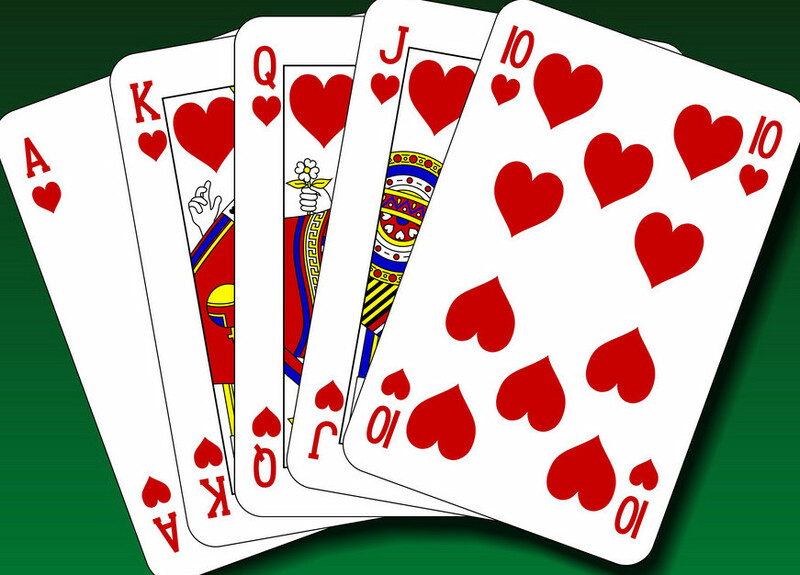 Three players are still in this hand. On the turn, with the board reading A♥K♥4♦ – 6♦ and $185 already in the pot, the first player to act checked. For purposes of this blog, I’ll call him “Ed.” I don’t have specific reads on him. Then Omar bet $75, I called and Ed also called, although he didn’t look particularly happy about it and didn’t show any aggression to suggest protecting a strong hand that would be vulnerable to the many possible draws. There are two different flush draws here, hearts and diamonds, and numerous straight draws too. There are more plausible diamond combos than heart combos, however, as either player could have A♦X♦ or K♦X♦ (but not Q♦ as I had that in my hand), whilst the A♥ and K♥ are both exposed on the center of the table. Let’s back up further. On the flop of A♥K♥4♦, everybody checked. I was last to act, and checked with what I expected was the best hand (AQo) as I felt the risk of draws was tolerable in exchange for a greater opportunity to get value from weaker hands (like KQ or JJ) on a later street. Or catch bluffs by Omar, as I believe is the case with his turn bet, and made even sweeter with Ed’s reluctant over call. This is a non-standard line and my action here is highly questionable. Most of the time, I would just bet for value. From a meta-game standpoint, however, I want to vary my play just enough to avoid being too transparent. Let’s back up further and perhaps this will make more sense (or become obvious that checking on the flop was a big mistake). Ed raised to $15 pre-flop from middle position. Omar called $15. With AQo and position on both of them in the cutoff seat, I re-raised to $60. At this table, most pre-flop raises are larger than $15, so Ed’s sizing seems like a tell that he has the kind of hand that plays well when it connects in multi-way pots but is easily abandoned when it misses. In other words, a hand like suited aces, suited connectors and 1-gappers, or medium pocket pairs. I think Ed has given me a bet-sizing tell, and Omar’s call – as opposed to a re-raise – also puts a cap on his range. Without knowing exactly what Omar has, I can conclude that he doesn’t have AA, KK, QQ or AK. This leaves me in good shape, although I’ll be perfectly happy if they both fold to my squeeze. Everyone else folds, and both Ed and Omar call $60. Remember Ed’s unenthusiastic call of $75 on the turn? A hand like A♦T♦ perfectly fits that narrative, having flopped top pair with a vulnerable kicker and picked up a diamond draw on the turn. So does K♦J♦ and several other diamond draw combinations. On the other hand, the flop isn’t nearly as drawy as it looks. Most $2/5 players won’t pay $60 pre-flop with QJ, QT or JT, suited or not. Those hands might raise to $15 or call $15, then go into the muck when facing my re-raise and being out-of-position on all subsequent betting rounds. So there won’t be nearly as many straight draws as in a single-raise multi-way pot. The strongest combination of two hearts, Q♥J♥. is among those hands that would frequently fold pre. If Q♥J♥ folds, doesn’t every weaker hearts combo also fold? Putting my 3-bet together with the high cards on this flop eliminates nearly all straight and flush draw combos from both Ed’s and Omar’s ranges, making my check-back line not unreasonable. Back to Omar’s river bet. Now that the Q♥ also is on the board, we have to ask whether Omar would have called $60 pre-flop (and out-of-position) with J♥T♥, or with any weaker suited combo such as J♥9♥ or T♥9♥. Inside my head, I hear a long, drawn out “mayyyyy-y-y-bee” regarding J♥T♥, but that trails off into a “nah” for all other flush combos. So, Holy Crap!, if Omar is representing a flush with his $300 river bet, he is representing a Royal Flush! Let’s look at it from his point of view. After I re-raised pre-flop, I checked back on the flop and just called his turn bet. If he’s a thinking player, what might he think I have? He can conclude that it’s virtually impossible for me to have a flush or straight when the Q♥ lands on the river. My 3-bet range (perhaps TT+, AQ+) doesn’t include ANY combinations that would get there. So if he thinks he can represent a flush and both Ed and I will buy what he’s selling (or have ranges that are simply too weak to call even if we don’t believe him), a bluff will often succeed with this scary looking board. That leaves me facing a highly polarized situation. After betting $75 on the turn, Omar ratcheted it up to $300 on the river. He has pure, double-barrel airball bluffs in his range as well as missed diamond draws. Would he bet for thin value here with KQ? As I was trying to put all this together at the table, it seemed like he either had a Royal Flush, long-shot that that would be, or a bluff. Other than the Royal Flush, his value-betting range is empty. With one combo to make a Royal and many combos of bluffs in his range, and a strong bluff-catching hand of my own, I make the call. Ed shakes his head a couple times, mutters that now he definitely can’t call (leaving me further suspecting A♦X♦ or K♦X♦) and folds. So dear readers, if you’ve been a follower of this blog and pay attention to the theme, you already know the title is They Always Have It. My read was correct. He had it. But which one??? Did he ‘always have’ a Royal Flush and I paid him off? Or did he ‘always have’ a bluff and I picked it off to win a $1,000+ pot? Please leave your votes and analysis in the comments, and I’ll post an update in a few days. Interesting… see more detailed reply to Michael P’s comment about possible sets. Are 44 or 66 in his range as well? You didn’t say how deep you were, but it’s likely you were both probably over $660 when you started the hand. If that’s true he’d have the right implied odds to call the $60 preflop. Then if he flopped the set he’d likely check to the bettor, even on the wet board. If you checked behind, and he didn’t have 44, but 66 then he hit on the turn. Either way he would bet to protect his hand, although $75 is pretty small for that. It would probably be more like $100+. That Qh seems like a really bad card for him since it completes lots of draws from the flop, but if he read your hand like he would if he were bluffing, he could merge his range. He’s knows it’s very unlikely you have a flush or straight, so could he value bet a small set here? And if you had AA/KK/AK, you would have raised the turn against 2 opponents. If you had QQ, then you got there, but he still might value bet. Or are there reasons to discard 44/66 from his range? Good points Michael. Omar’s set-mining odds pre-flop are OK, especially after Ed calls $60. We were $800++ deep. They key is where you note that $75 is “pretty small” as a turn bet. I’d say “very small” as the pot was already $185, making this only 40% of pot. With the very draw-heavy looking board on the turn, I cannot picture Omar betting so small on the turn with a set of 666’s or 444’s. If he has a set, why would he bet less than 1/2 pot on the turn, then more than 1/2 of a much larger pot after that river card??? So I discard sets from his range, which (spoiler alert) he didn’t have. Mathematically it’s more likely he has something like Jhx/10hx but intuitively I say he’s got the royal. Time for a reveal. Of course he had a Royal Flush. They Always Have It. Something else occurred to me. Was there any kind of table bonus for HH or better a royal showing? I know you did not qualify for bad beat, but if you get a table share… it could be insurance. MGM does have a $500 Royal Flush bonus, but doesn’t require the hand to go all the way to showdown, nor is there any table share.